Brave police officers who restrained a man wielding a knife, shears, a saw and a garden fork are up for an award. The incredible scenario in the town of March late last year saw PCs Janine Hagger and Pete Moulton both attacked and cut by a Stanley knife, while PC Hagger was also punched in the face and PC Moulton bitten on his left arm. The 21-year-old assailant they were attacked by also held a saw to throat of another man which scratched and cut him. 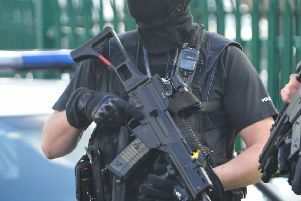 In the end it took a team of officers - including firearms officers - to contain the individual after a lengthy struggle. PC Hagger and PC Moulton are now both up for a Police Bravery Award on Tuesday (October 27) with a reception at Downing Street and an evening awards ceremony. The award nomination follows the incident at a house in March in November 2014 which the officers attended following a call from the ambulance service. PC Hagger and PC Moulton were alerted to a 21-year-old man, believed to be in possession of a bladed weapon. The officers immediately spotted the man, who they believed to be suffering from mental health issues, but he then ran off. The officers pursued him into a garden where it became clear he was carrying a Stanley knife. In an attempt to calm the situation the officers sprayed him with Pava but to no avail. As the officers again attempted to stop the man, he slashed at PC Moulton, who suffered a 6cm laceration across his neck. The knifeman then attempted to slash, stab and hit the officers. During the struggle, PC Moulton was also bitten three times on his left arm. PC Hagger was punched in the face and received a laceration to her left little finger and ring finger from the same Stanley knife as she tried to disarm the man. The assailant then grabbed a garden fork and threatened the officers with it. He then kicked PC Hagger in the stomach and punched her twice more on the head, causing her to almost black out as she tried to assist PC Moulton in pulling the fork away. The man then ran at the officers with a handsaw and shears he had grabbed from a garden shed. Officers used Taser and Pava again but they were only able to overcome and control him when many more officers arrived. The man was unusually strong and was finally subdued under sedation later at hospital.